Each year, the National Center for Health Statistics publishes a report card of sorts on the nation's health. Health, United States is chock full of graphs, charts, tables, and analysis. The latest edition includes a section on the use of statins, the family of cholesterol-lowering drugs we often mention. (First introduced in the late 1980s, seven statins are currently on the market, including Crestor, Lipitor, and Zocor.) 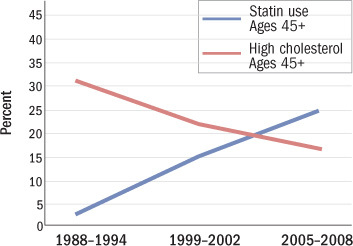 One in four adults ages 45 and older now takes a statin. Data from another chart suggest that statins are contributing to the decline in Americans with high cholesterol. Statins don't work miracles, and in some people cause muscle pain and other unwanted side effects. Diet and exercise are the first and best places to start if you need to lower the amount of harmful low-density lipoprotein (LDL) in your bloodstream. If they don't work, a statin or other cholesterol-lowering medication can help.